It is known that a significant percentage of the population suffers from circulation problems, both of lymphatic and venous origin. Impaired lymphatic function, including drainage and return of interstitial fluid proteins, is involved in the development of chronic damage associated with lymphoedema, a form of high-protein oedema, coupled with chronic inflammation and tissue fibrosis. The main cause is an increase in capillary filtration and insufficient venous and lymphatic reabsorption. Oedema is one of the key symptoms of chronic peripheral venous insufficiency and varicosities in the lower limbs. According to a number of animal and human studies, plants rich in coumarins, flavonoids and terpenoids have been shown to be highly effective in treating the symptoms of these veno-lymphatic disorders. Use of these substances can help provide long-lasting control of symptoms ranging from more minor problems such as heavy or swollen legs brought on by hot weather, to microangiopathies affecting the small blood vessels, as well as varicosities and haemorrhoids. 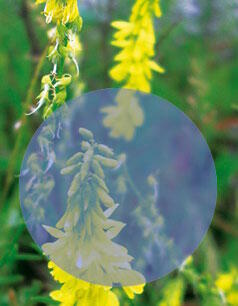 However, it is only melilotus officinalis extracts standardised in coumarins - natural compounds from the benzopyrene family, extensively studied and known for their ability to promote easy blood flow and stimulate lymph flow – that are fully recognised by the scientific community as providing these beneficial effects. For noticeable and long-lasting symptomatic relief, women, sportspeople, those on their feet all day or who suffer from restless legs and discomfort at bedtime, are recommended to take the equivalent of 15mg coumarin a day, throughout the summer period or for at least three months.